Are we in a period of increased earthquake activity ? Seismologists normally expect, on average, one magnitude 8 earthquake to occur per year, somewhere in the world, and, again on average, just one magnitude 9 earthquake per decade. While these numbers are just expectations of averages, the recent Japan earthquake (Mw 9.0), following just 7 years after the 2004 Mw 9.1 Sumatra earthquake, and just 1 year after the 2010 Mw 8.8 Maule, Chile earthquake, raises the question: Are we in a period of increased global earthquake activity ? To answer this question, I produced a spreadsheet using the largest (Mw >= 8.5) earthquakes in the world since 1900 (which is around when we began recording earthquakes instrumentally so that we can accurately measure earthquake magnitudes). When you go to clean up your computer disk, you probably start by arranging the files in order of decreasing size, with the largest files at the top. You do this because it’s much more efficient to remove a single, large file, then to track down and remove many small files. In the same way, a single large earthquake (e.g., Mw >= 8.5) releases much more energy than all of the smaller earthquakes put together, and accounts for most of the seismic energy release within a given time period. Table 1. Largest earthquakes (Mw >= 8.5) in the world since 1900, arranged chronologically and converted to energy. 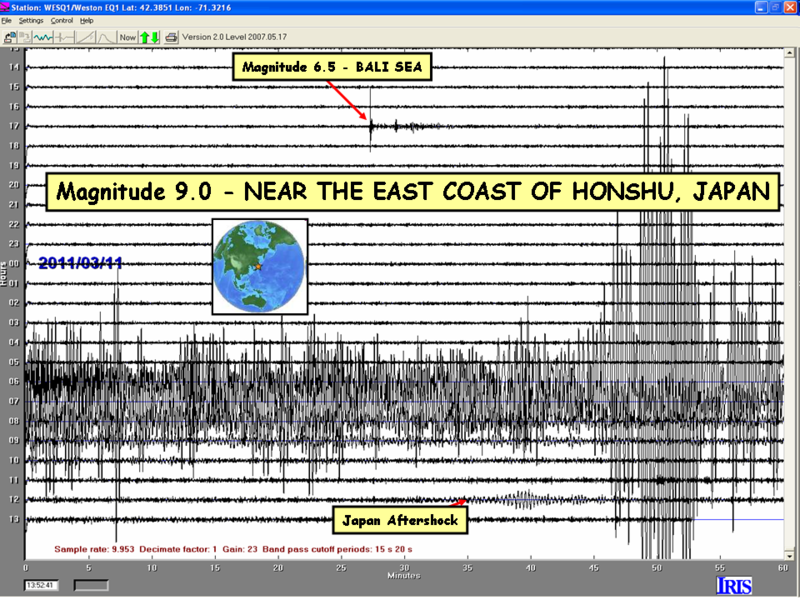 The NESN recorded the devastating magnitude 9.0 earthquake near the East coast of Honshu, Japan on March 11, 2011. 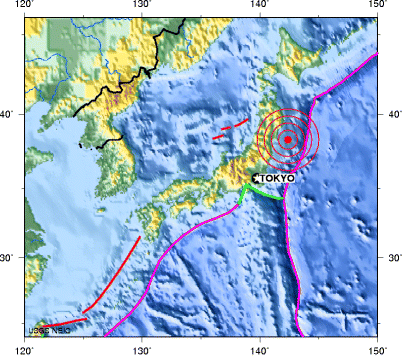 This is the largest recorded earthquake in Japan and the 5th largest earthquake recorded in the World. Fires broke out at oil refineries, firefighters continue to battle a large fire at Cosmo Oil Co.’s refinery, 40 kilometers east of Tokyo. Millions of homes are without electricity as utilities shut 11 nuclear power reactors. For a list of aftershocks of magnitude 5.0 and larger, go to Latest USGS Earthquakes. 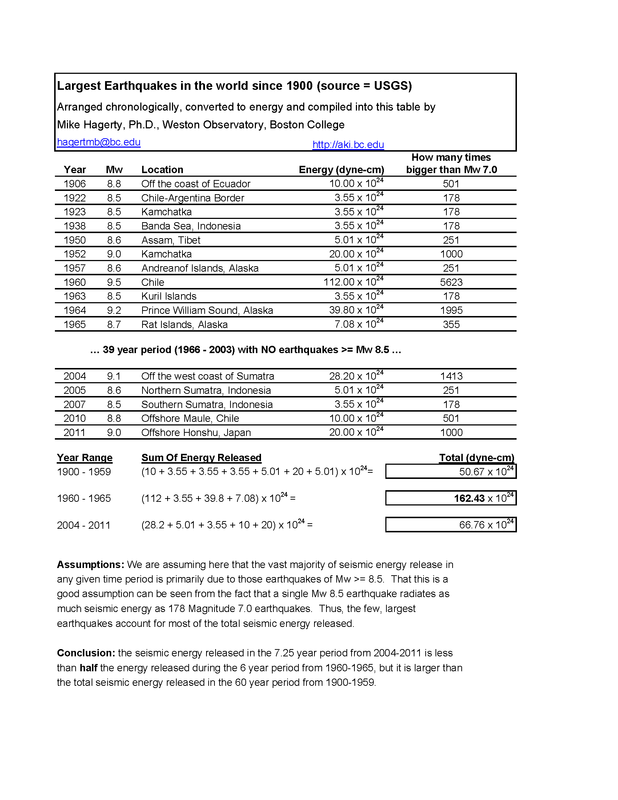 For a tectonic summary, go to USGS Tectonic Summary. A power point on the tectonics and details of this devastating earthquake and tsunami can be downloaded from the IRIS website here. To download a PDF of this IRIS presentation, click here. A tsunami was generated by this enormous quake and traveled miles inland Japan sending a massive body of water filled with debris that included cars, boats and houses. The western Aleutian Islands, Alaska, were hit at 4 a.m. EST by a 5.1 foot wave. Shemya, Alaska was reporting no damage despite the sizeable wave. By the time it reached the commercial fishing town of Dutch Harbor, the wave was just 1.6 feet. For more tsunami info visit the Pacific Tsunami Warning Center. For an animation of how the D.A.R.T. II deep ocean system works in assessing and reporting a tsunami, click here.